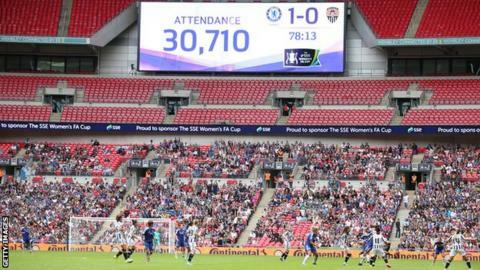 The Women's FA Cup final is set for a new attendance record after initial ticket sales of more than 30,000, the Football Association has said. Holders Chelsea Ladies face 13-time winners Arsenal at Wembley on Saturday. A competition record of 30,710 attended last year's final, the first to be held at the national stadium, as Chelsea won 1-0 against Notts County. Fewer than 5,000 fans turned out for the 2013 final at Doncaster's Keepmoat Stadium, when Arsenal beat Bristol 3-0. The competition, which was first staged in 1971, also saw finals played at venues including Dunstable Town FC and Scunthorpe's Glanford Park, before being held at Wembley for the first time last August. Last year's bumper crowd came only a month after England's historic third-place finish at the World Cup in Canada. "It's excellent news that we're looking set to match and even surpass last year's ticket sales," said Kelly Simmons, FA head of football participation and development. "Last year's final was a fantastic occasion and another landmark for women's football, and we're delighted that this year's looks set to be another fitting showcase for the game." In this season's semi-finals, Arsenal thrashed Sunderland 7-0 to reach their 15th final, while Chelsea beat league leaders Manchester City 2-1 after extra-time. Last month, Chelsea boss Emma Hayes said she hoped to see a crowd in excess of 50,000 to watch this year's all-London final.